How Long Does it Take? How Many Visits are Required? What If I Have a Problem with My Dental Work? For those living in the American Southwest, it is not uncommon to take a day trip across the border to Mexico for dental work, including advanced dental implant procedures. People coming from further afield often choose to combine their dental treatment with a Mexican vacation, taking the opportunity to recuperate on the beautiful beaches. The close proximity of Mexico is definitely an attraction, but Mexico is also a favorite with Americans because most clinics have English-speaking medical staff. It is becoming an increasingly popular choice amongst Americans and Canadian nationals who are willing to travel to Mexico for dental and other medical care. As the popularity of dental tourism has increased, so has the number of high-quality dental clinics. This is also partly due to the increase in the number of middle-class Mexicans able to afford private health care. Accredited hospitals and clinics in Mexico are easily comparable with those in the United States, while prices can be drastically cheaper. These clinics employ highly trained dentists who are up-to-date with the latest or most recently approved treatments, as well as dental procedures that are tried and trusted. Most Mexican dentists have trained in Mexico but will frequently travel to the U.S. for postgraduate or specialty training. Traveling to Mexico can be an inexpensive option, especially during the low season. From your initial contact with your Dental Coordinator, to meeting the staff and doctors, you will be dealing with caring professionals who are genuinely interested in your dental health. You are putting yourself in the hands of a Group of Specialists with over 100 years of combined experience. Get a free consultation with Cancun Dental Specialists. The cost of this treatment may be up to 70% cheaper compared to similar treatments in the United States. Dental clinics are able to offer lower prices thanks to lower labor costs because the overall cost of living is cheaper. Education and training are cheaper and dentists have to pay less insurance, and there is less government intervention. The average cost of dental procedures including implants, bridges and crowns in Mexico is as follows. Costs shown are averages based on prices at 598 dental clinics in Mexico and do not represent actual quotes. See our guide on how to save money on dental implants. Flights to Mexico and transportation to and from the clinic. A gallon of gas costs around $2.60, while 1 mile in a taxi costs an average of $0.65. Hotels or accommodation. Mexico has a huge range of accommodation available to suit everyone’s budget. You can stay in a budget hotel for as little as $10 a night, while even a five-star hotel could cost less than $100 a night. Food and drinks. The average cost of a meal at an inexpensive restaurant is just $4, while a domestic beer will cost just $1. A meal in a mid-range restaurant costs approximately $20. Expect to pay higher prices in tourist resorts. Whether you need to take unpaid leave from work. These figures will give you a rough idea of the type of savings to be made by traveling across the border, but it is important to realize costs can vary tremendously in both Mexico and the U.S. It can also depend on the type of materials/components used. Some dental clinics in both countries will use generic implant components, whereas others will use parts produced by one of the major implant manufacturers. Although many people will travel to Mexico for dental implants, dental clinics are able to offer a comprehensive range of dental treatments. A combination of treatments is often needed to help restore dental health. The treatments listed below represent just a few of the options available to dental tourists. Dental implants are an enormously popular option for people missing one or more teeth due to injury, decay or periodontal disease. They consist of a titanium post that is surgically inserted into the jawbone and which is strong enough to hold replacement teeth or even a bridge. This is a popular solution for people currently wearing full dentures. Four dental implants are inserted into the jawbone, towards the front of the arch where the bone is thickest and strongest. The implants are then used to support a new denture that will clip onto the dental implants so it is held securely in place. This option is particularly useful for replacing lower dentures as these can frequently become loose and ill-fitting after being worn for just a few years. 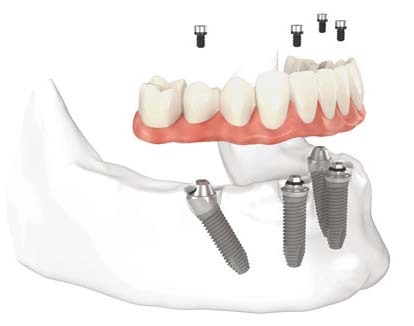 Another possibility is to use dental implants to support a permanent bridge of teeth that will be screwed in place and which can only be removed by a dentist. Patients typically receive their new teeth within 24 hours of implant surgery, so there is no fear of being left without teeth for an extended period of time. Root canal therapy is a procedure to remove the damaged nerve of a tooth which is contained in the pulp, right in the central part of the tooth. The pulp can become infected due to trauma or decay, or it can become inflamed and painful if a tooth receives a knock. This treatment will remove the pulp and the dentist for thoroughly clean and disinfect the empty chamber before permanently filling and sealing it. Often a tooth that has received root canal therapy will be restored with a dental crown. 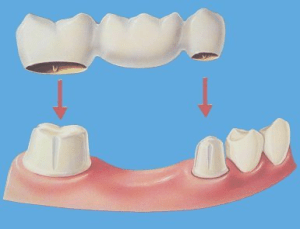 A bridge can fill in the gap left behind by a missing tooth or teeth in the same area of the mouth. It consists of two crowns that are fitted over the teeth adjacent to the gap. These teeth are called the abutment teeth and the crowns are attached to the replacement teeth that are custom-made to fill in the space left by the missing teeth. Each of these teeth is called a pontic and a dental bridge can be made from a number of different materials. A bridge can be made from gold that is highly polished, or from a precious metal alloy that is covered up with porcelain. The highest quality bridges are made from porcelain and do not contain any metal. A dental bridge can be supported by natural teeth, provided they are strong enough, or by dental implants. How Long Does it Take? How Many Visits to Mexico are Required? Two appointments are required for dental implant treatment. Your implant will be placed during the first appointment. It must then be left to heal for 3-6 months. A temporary tooth can be provided during the healing period. After healing is complete, the abutment can be attached to the post and your permanent crown is placed and adjusted. It is becoming increasingly common for dentists in Mexico and in the United States to use what are called “immediate load” dental implants. With this procedure, it’s possible to attach new teeth to the dental implant soon after surgery, without waiting several months for the implant post to heal. Sometimes these teeth are temporary and are designed to let you smile, talk and eat in relative comfort. These teeth are replaced once the implant has had time to heal. 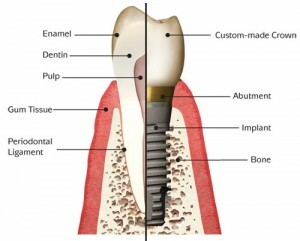 However, the teeth attached to the dental implant will be the permanent teeth, completing the treatment. It all depends on the procedure used to replace your missing teeth. When choosing your clinic in Mexico, look for one that will offer some form of guarantee or warranty in their contract. This should state that if you have a problem with your implant due to workmanship or materials, the cost of repairing or replacing the work will be covered. Take the time to read the document thoroughly and to find out the length of the guarantee and whether it will include corrective treatment in your home country. Make sure you understand about any complications or situations that are excluded from this guarantee. It is important to be aware that most dental clinics in Mexico will not pay for corrective treatment outside the clinic. If something goes wrong with your work, there’s a good chance you will have to return to Mexico to have it corrected under the terms of the guarantee. 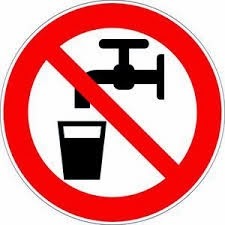 This is a common problem when traveling anywhere in the world, as drinking water in a new location can make you feel ill. In Mexico, make sure you stick to purchasing bottled water with an unbroken seal. Use bottled water to clean your teeth. Avoid ice in beverages as this could well be made from tap water. 2) Best Time to Visit? Mexico is pleasant at any time of the year, but heat and humidity can vary so it’s worth checking the temperatures in the area you are due to visit. The weather systems in Mexico can be quite diverse, with the north experiencing cooler temperatures during the winter months, while the south, including the Yucatán Peninsula, tends to enjoy fairly constant temperatures right throughout the year. 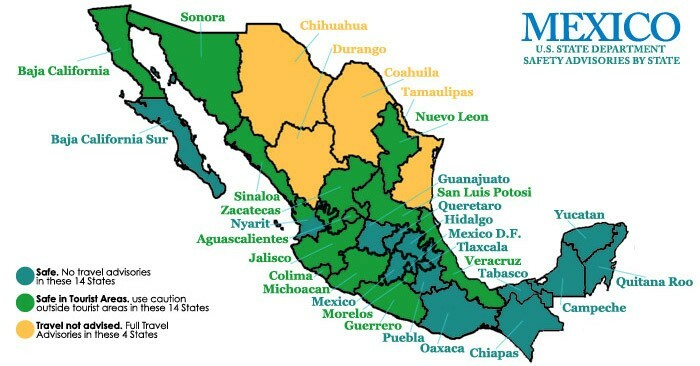 Both Mexican coasts are prone to hurricanes during the summer and fall months. Peak tourist months tend to be December to February when the weather is slightly cooler. However, local and national holidays and festivals can mean it’s busier at other times of the year and you will need to book ahead for accommodation and for dental appointments. The low season in Mexico is from late spring to early fall, with Christmas and New Year being the most expensive times to visit. Prices tend to stay high during the winter as Mexico is an attractive location for travelers trying to escape the cold weather. After Easter, prices begin to fall. If you intend visiting coastal areas, avoid the hurricane season which runs from June through October. 4) What Payment Methods Are Accepted? Most dental clinics in Mexico will accept US dollars and many will also accept credit/debit cards, checks, and traveler’s checks. It’s worth checking with your chosen clinic as to their preferred method of pavement, and often credit card payments will be subject to a 3-4% processing fee. Nationals from the United States, Canada, Australia and New Zealand and the EU do not need tourist visas. However, it’s worth checking on your government’s website before you travel as these rules can change. When you arrive in Mexico, you will need to fill out a Mexican government tourist card which must be stamped by Mexican immigration before you can enter the country. This allows you to stay for up to 180 days, although sometimes the immigration authorities will alter this to 15 or 30 days. Wait times at the border crossings can be long, although some crossings now have dedicated medical tourist lanes helping to reduce these times. However, there is still likely to be a lengthy wait to re-enter the US. It’s worth being prepared for this with plenty of bottled water. 7) Is Mexico Safe to Visit? Every year, millions of US citizens safely visit Mexico for tourism, business or to study. Approximately 150,000 citizens cross the border every day. The Mexican government has invested heavily in resources to protect people visiting major tourist destinations and there is no evidence of organized criminal groups targeting US visitors or residents based on nationality. Generally, tourist destinations and resorts in Mexico do not see the levels of drug-related violence and crime experienced along major trafficking routes or in the border region. Going to Mexico is really a cheaper option; paid $700-900/implant and another $200 for the graft (if needed), $350 for a porcelain crown 6 months later. 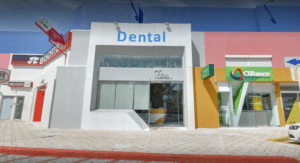 The dentist in Algodones, Dr. Franco. is fluent in English and we are happy with the other procedures he had done ( tooth extraction, crown, root canal by his associate endodontist). The problem is , 8 weeks later after my implant on tooth #3 on the upper jaw, I still have a concussion-like symptoms like inability to concentrate, dizziness, headaches, loss of balance. He used the osteotome and mallet to push the titanium implant so I had about 60 blows to my head. Now I have to get a second opinion on these symptoms as I am not sure if the implant went to my sinus (x-ray 4 weeks ago showed its in place), or labyrinthine concussion (complications from using an osteotome), allergy to the titanium. My 2 other implants in the US last Dec. 2015 had no problems and the oral surgeon had good follow up. From what I have been reading there are other alternative to using an osteotome – they use this in the US too so be warned! I just got home from Los Algodones Mexico. My mom and I both had procedures with Dr. Mendez. Mom had 3 extractions on her lower jaw and she has new upper and lower dentures. Her cost was just over $800. US dollars. I needed full restoration. I had 12 extractions, 2 bone grafts, and 8 implants. Four on the top front and four on the bottom front. I was sedated for about 4 hours. I was sent packing with my temporary teeth, antibiotics, pain medication, anti-inflammatories, and very little for post op care instructions. I’m told to let these heal for at least 3 months and to wear my temporary dentures as infrequently as I can. I’ve had normal pain. Eating is a challenge. But I really don’t know what’s next. I guess I go back when they’re healed and get my permanent teeth. This for just under $10,000. Does not include permanent teeth. I think I’ll see my dentist here soon and see what he has to say. He quoted me $25,000. for 4 implants upper and a permanent bridge. I would go to an oral surgeon for the extractions. He’s going to kill me Hahaha!! So far so good here. Three weeks post op tomorrow. I went to Merida, Mexico. Had two implants started on molars. The quoted price was 25,000 Mexican Pesos, or CAN$2,000, per tooth. That’s for the whole shootin match, crowns included. One tooth ended up costing CAN$500 more, because it required an extensive bone graft. I say ”started” because the initial procedure was done in November 2015, with the graft and the studs installed, but we have to wait several months to allow the graft to heal before installing the crowns. I’m looking at going back before the end of 2016, Nov-Dec like. I only had to pay for half the procedure at that time, the other half payable upon completion when I go back. The equivalent in Canada would have cost 10 times more. I can’t give you a final statement of satisfaction until the whole procedure is done and then a few months to see how it stands up. But all I’ve heard of this clinic has been excellent so far.